- Wal-Mart's looking to unload its $40 million digital ad account. The shortlist includes Resource, Digitas, MRM, R/GA and Razorfish. - Digital Mad Men! Watch. Watch. Because Vince Kartheiser talking Caturday is probably the funniest he's been in his short career so far. - Dell cracks open Design Studio -- where users can pay $75 to get a unique image "permanently tattoed" onto their laptop lids. o_O That's a slightly steeper commitment than the peel-off-friendly GelaSkins. - Arby's brings hard-ons. I really hope they don't put this on TV. - MySpace does video streaming on mobile phones. With ad support. - As of January 1, adult social networks will not be permitted on Ning. (Pretty good) reasons listed in the link. - YouTube cobbles together digital chamber music orchestra. i already saw that arby's ad run on MTV. I've seen the Arby's ad AT LEAST 5 times in the last few days. I think I become a little more scarred each time. Ew. Double Ew. 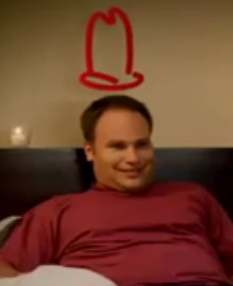 I heard my husband laugh out loud and then he called me into watch this Arby's commercial. He thought it was pretty clever. It was amusing, but it was definitely targeted to the male audience.